Temporary Class B License (Beer & Wine): To obtain a license to temporarily sell beer and wine, you must be a bona fide club, association, lodge or society. Operator “Bartender” License: This license is required to sell alcoholic beverages. New applicants must complete a Wisconsin Approved Responsible Beverage Course and provide a certificate of completion OR provide an operator’s license within the last 2 years. Provisional Operators License: This license can be issued for 60 days prior to Board approval of an Operator’s License. Temporary Bartender’s License: May be obtained to serve alcohol at an approved event where a Temporary Class B has been issued and not to exceed 14 consecutive days. Below is a link to all RBS (Responsible Beverage Server) approved training courses. Tips is one of the approved courses and their certificates are valid in Wisconsin. Cigarette and Tobacco License: This license is required for any cigarette or tobacco sales. Soda & Non-Intoxicating Beverage License: This license is required where soda and non-intoxicating beverages are sold or consumed. Transient Merchants License: This license is required for door-to-door solicitations. All requests are subject to a background check. Special Event Permit: This permit is required for an alcohol licensed premise that seeks outside amplified music. Street Use Permit: This permit is required for street closers for an event. Application must be approved by the Police, Fire and Hwy Departments prior to being issued. Fireworks Permit: This permit is required to both sell or discharge fireworks. Permits for discharge may only be issued to a public authority, park board, fair association, civic organization, amusement park or agricultural producer. Kennel License: License may be obtained to keep up to 12 dogs in an outside kennel provided the property is zoned Agricultural. New Kennel Licenses require approval by the Humane Officer and the License and Legislative Committee. Kennel licenses are renewed yearly. Fancier’s License: License may be obtained to keep up to five dogs if your parcel is at least one acre and seven dogs may be kept if your parcel is at least 3 acres. All dogs must be housed overnight indoors. New Fancier’s Licenses require approval by the Humane Officer and the License and Legislative Committee. This license is also renewed yearly. Dog Licenses: Dog licenses do not require an application, and may be obtained at Village Hall between the hours of 8am and 5pm. You must provide proof of vaccination including the date administered, manufacturer and lot number. To request your license by mail, be sure to include the check, proof of vaccination and a self-addressed, stamped envelope. All dogs must be licensed by December 31st of that year or a late fee is assessed. January 1st, a late fee of $5.00 will be charged. An additional $25 fee will be added starting May 1st. Tent Permits: No permit is required. Racine County may require a temporary occupancy permit depending upon use (contact Racine County Planning and Zoning Department (886-8440). Inspection: An occupancy inspection is required for tents used for commercial or public events, and by request for private events. 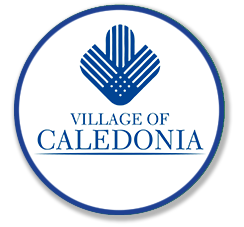 Call Caledonia Fire Department (835-2050). Requirements apply to tents for commercial and public events, and for safety reasons, are recommended for tents at private gatherings.